LeDomduVin: 2011: Happy New Year! Bonne Année! Feliz Ano Nuevo! 2011: Happy New Year! Bonne Année! Feliz Ano Nuevo! Cheers! Happy New Year and Best Wishes to You All! With more wine discoveries and multiple other things to talk about! The end of the year was fantastic for me because I became for the second time the father of a beautiful baby, this time an adorable little girl. I must say that 2011 begins really well with the arrival of my daughter, despite the fact that the world is a mess. Money, politic, power, greed, hate, racism, corruption, despair, envy and religious beliefs, amongst many other things, seems to be the everyday fate of mankind these days. What a pity to destroy in such horrible ways such a wonderful world! Why can we try to find compromises and live more in harmony without killing, tricking and deceiving each other in daily nonsense wars, behaviors and attitudes toward each other? Fortunately for us, optimistic believers, immoderate epicureans and insatiable gourmets (novices, amateurs and connoisseurs all included of course, like a big family), fervent lover of great food, wine, spirits, cigar, art, culture, geography, history and many other of the multiple and highly rewarding pleasures in Life, there are still plenty of beautiful and positive things to care about in this world that make us fight for a better future (more especially if you have kids). Kids are amazing! Your parents gave birth to you and in turn you give birth too, completing a old circle of life that started millions of years ago. You created a being. A being that you will guide, supervise, influence and protect most of your life. A being that will most likely follow your example and imitate your ways and manners and habits and morals to a certain extend. That being is innocent and didn't demanded to come to earth and live in such human misery and depravation. Therefore, as human, supposedly one of the most intelligent species on the planet, it is your goal and choice to do your best to act responsibly and respectfully toward your environment and other beings and livings, to preserve the harmony of nature and leave a better world for the next generation. For all these reasons, for my kids and their future, I have to be and remain positive and do my best about upbringing them the best I can, by giving them as much love, respect and consideration as I can, as well as passing as my much of my knowledge, morals, values and interests. Like my grand-parents and parents did for me, I will teach my kids to develop their attention to positive, concrete and constructive things that will lead them to live a better life and care for others, all things nature has to offer and the environment. Money may be somewhat important in our capitalist world, yet NO need to tell them that it is not the most essential thing in life, they will realize that by themselves. They may be young, but I already began their apprenticeship: reading, counting, spelling, and finding solutions to all problems they may face is the base. Try in any circumstances to be optimistic and willing to always address a situation with reflection and intelligence; because there are so many kids around the world that may and will never have the chance (that my kids will have) to have a decent, educated life, not in luxury and profusion of unnecessary things but in the harmony of the family and the love and respect that we have for each-other. Moreover, as a Sommelier, I also teach them the importance of discovering, discerning, smelling and tasting their food and drinks (fruit and vegetable juice for now, wine and spirits later on gradually) everywhere and everyday at home, at the supermarket or the green-market, at the restaurant or anywhere else. It is important that they understand from their young age the immense value of food and the chance that they have to be able to eat well and healthfully compared to so many other people around the world these days. In the 1920-30s, we were only 2.5 billions on earth. After World War II and the consequence of the baby boom, we were about 4.5 billions. In the 80s, we were about 6 billions and in 2011, we are about 7 billions on earth. That's a lot of people evolving in a difficult world market, with many obstacles and much less job possibilities and opportunities than ever before, due to the rapid evolution of the technologies; the globalization of interests and entertainments; and the diminution of real interactive and caring social behaviors due to the increase of virtual social self-awareness (everybody thinks that they (he or/and she) are super important and that the world should know everything they do and say...) and the lack of real interests from the youngest generations. World economy, recent climate changes and natural disasters didn't help either to bring hope for the future. Yet, we have to remain hopeful for the future, for our kids and the next generations to come. And our generation should be the one ringing the alarm bell and put a stop to all these nonsenses and start to rebuilt a solid base of hope and new ideas. Hope come from positive attitude and desire to achieve better, for greater results and concrete ideas to develop other ideas and find solutions and move forward. Pointing at the various problems of the world is useless if we don't take action to resolve them. The agricultural world has already answered the distressed call from Mother Nature and started to change its ways. We have to follow its example. Let's make 2011 a year of actions and decisions. So Step into the Green! Drink more Biodynamic, Biologique and Organic wines and spirits and food) from sustainable culture and respect the environment! Support the right causes for the Planet and all the people suffering all around the globe! Also follow projects and products from the Fair Trade, an organized social movement and market-based approach that aims to help producers in developing countries obtain better trading conditions and promote sustainability. Also support 1% for the Planet, an alliance of businesses that donate at least 1% of their annual revenues to environmental organizations worldwide. "Commerce Equitable" or "Fair Trade" is evidently and more than ever a needed movement connecting producers and customers, to be aware of others and their cultural and traditional products based on high quality, natural components and craftsmanship. Let's save our planet and ourselves by the same occasion, by taking meaningful actions. There are many organizations and associations all around the world that have been created over the last 20-25+ years, to change our ways and make this world a better place: better wines, better food, better environment and decisions that will in the long term make the difference. Here is a short random list of links for these highly recommended organizations, associations and other enterprises (a few that I could think about immediately amongst many others) that have been and still are willing to make a change for the good of our planet and help world collective consciousness to awake to find the right and most appropriated solutions. They need your full support to continue the fight for the right causes. This list is by no mean exhaustive and only represent a drop in the ocean of all the people that are trying to change the world and make it a better place with more collective consciousness and positive desires and innovative solutions. Yet, it will give you an idea and may invite you to observe nature and our world on a whole new different way. Let's make 2011 a year of actions and decisions. 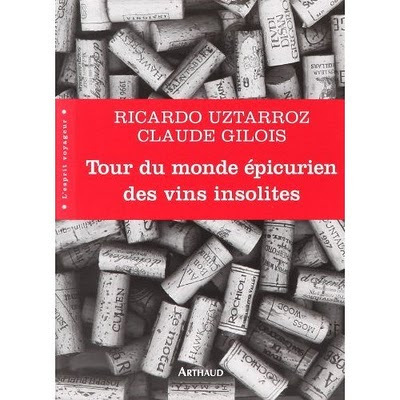 "Tour du Monde épicurien des vins insolites"
Last but not least, I just finished a great french book, called "Tour du Monde épicurien des vins insolites" (around the epicurean world of unusual wines), about the tribulations of two wine aficionados, Claude Gilois (owner and wine buyer of http://www.vinsdumonde.com) and his friend and writter Ricardo Uztarroz (journalist for "Presse Océan", "Libération" then at "l'AFP" for about 25 years) in quest of finding and tasting wines in rather unusual countries. This is a great read and a tremendously enjoyable journey to share with these two 60+ years old epicureans, avid of food adventures, wine discoveries and life experiences. The prose is exquisite, light and funny, pleasing and full of this old flair for loquacious and explicit scenarios, that only a writer-scenarist like Michel Audiard was capable of writing (I will highly recommend you to watch some of his classics: "Les Barbouzes", "Les Tontons Flingueurs", "Le President", "Le Cave se rebiffe", "Un singe en Hiver", etc...). Some of the quotes from Miquel de Cervantes as a sentence of introduction for each chapter also greatly introduce the sense of humor and the spirit of mind of these two uncommon wine travelers. A must read for those of you who understand French. Think about it.... and as always, Enjoy! See you soon for some new wine surprises and discoveries!